So, you’ve already heard about my experience baking for Cupcake Camp… I will be more organized and not forget ingredients next year! 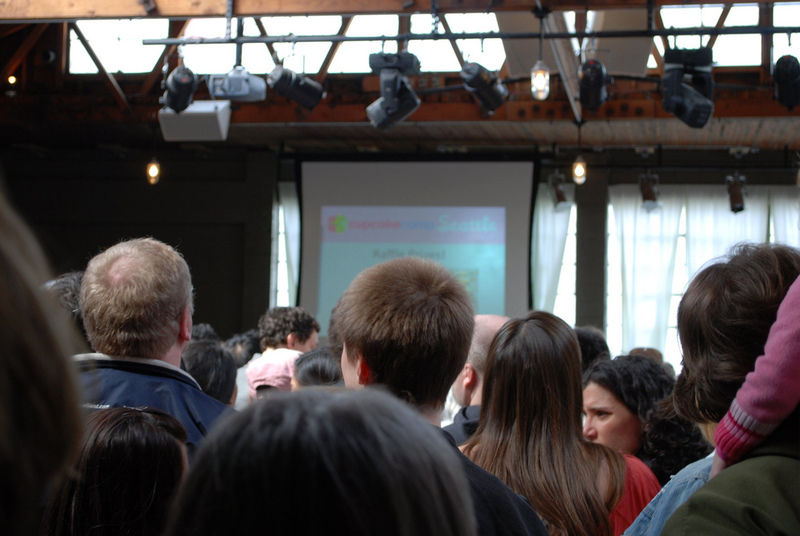 In spite of my difficulties in preparation, I was really excited about Cupcake Camp. 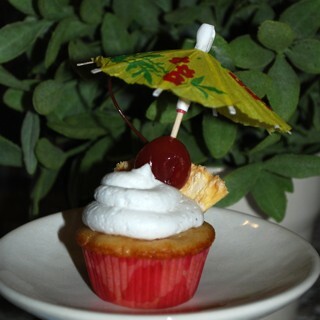 I thought I could take some cool cupcake photos and maybe meet some other bakers. I already had my volunteer assignment, which was helping at the children’s craft table, so I knew I wouldn’t get to see ALL the cupcakes. Mr Shuck, who I’ve already established is an angel, was volunteering with me (one of only 2 male volunteers listed) so I didn’t have to choose between him and cupcakes. When we arrived back at just before 11, there was already a line developing, so we squeezed past the people in line so we could take our place at the children’s craft area. 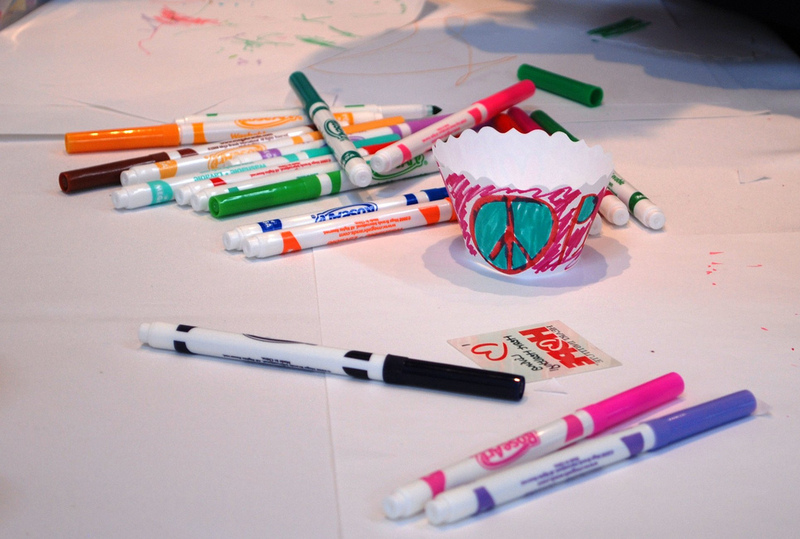 The craft activity was decorating blank cupcake wrappers, provided by the presenter, Bella Cupcake Couture, with markers and stickers. 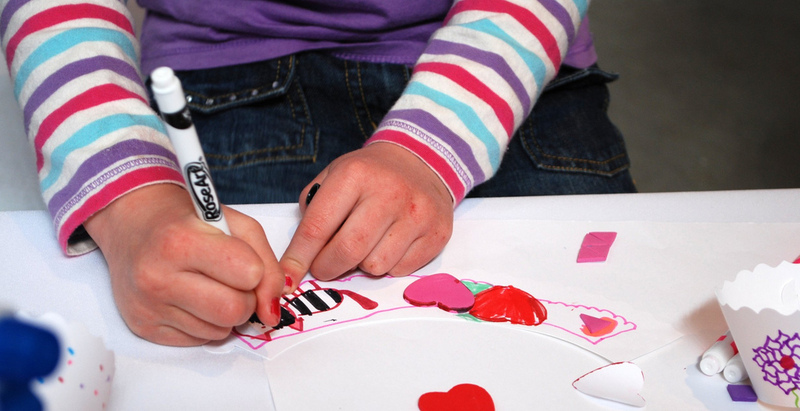 There were also temporary tattoos advertising the event charity, The Hope Heart Institute. We met our fellow volunteer, Orly, and got oriented to our area. Crafting had a slow start, so I took a few minutes out to go and take a few pictures of displays by professional bakers. I assumed I’d have a chance later to go back in and get more pictures of the amateur bakers wares. 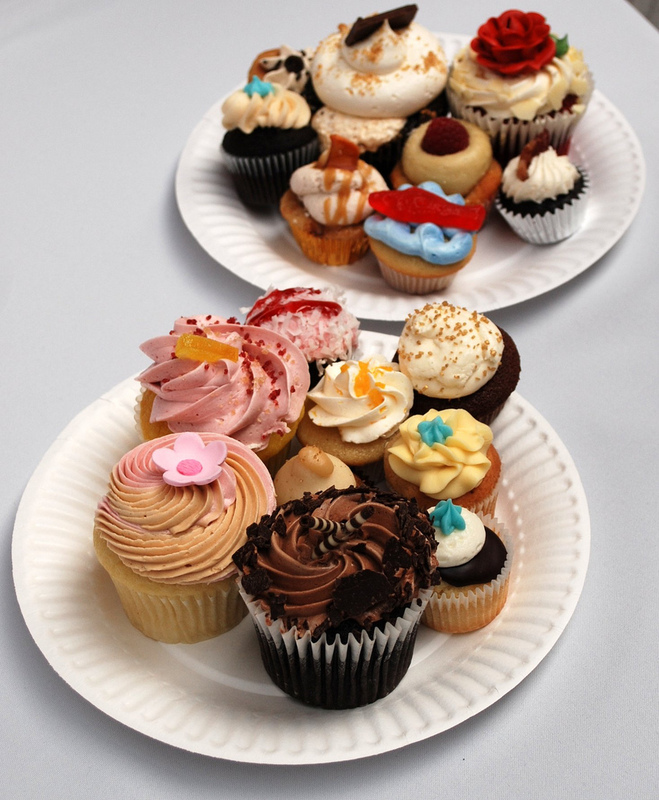 I was able to catch a few pictures of plates that attendees had filled with cupcakes and wondered how they’d eat those without becoming sick. I also was able to get a photo of my name on the schedule. I know it’s lame, but I was excited! 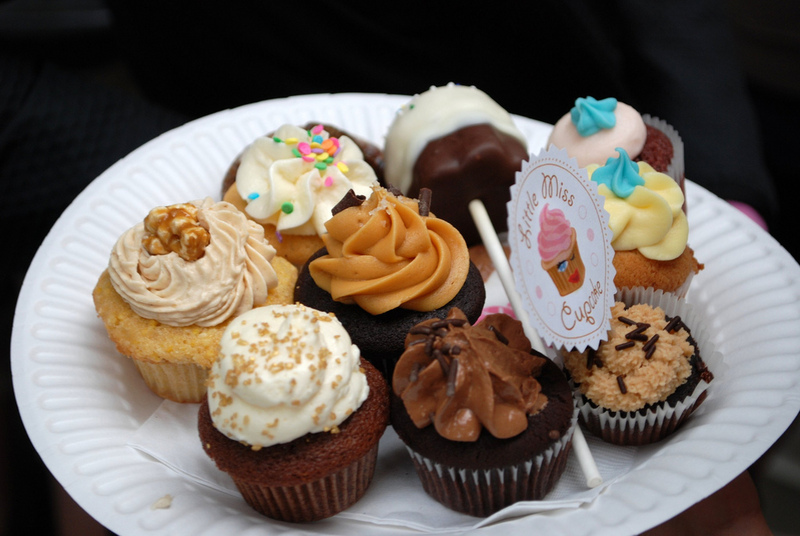 When I got to the table, I was thrilled to see people interested in my cupcakes. (I realize that these people were cupcake rabid and probably the flavors didn’t matter, but still…) As I said above, I’m easily excited. I couldn’t get around to my box of Caramel Popcorn cupcakes, I did see them on a couple of plates that passed by though. Made me happy that someone was about to try them. 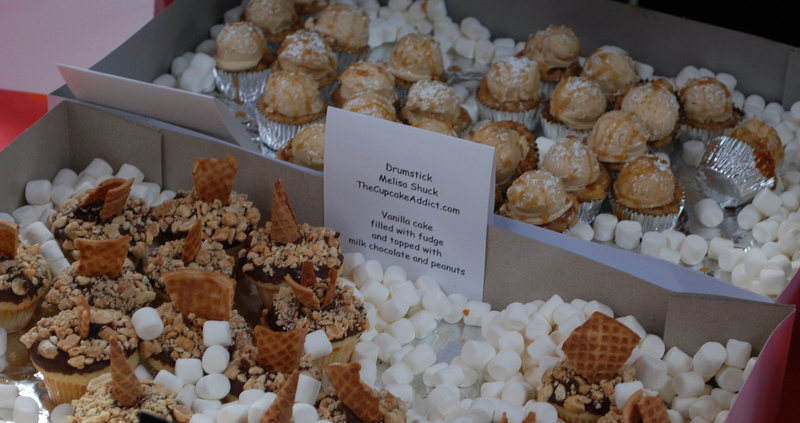 Cupcake Plate with Caramel Popcorn on it: Click to enlarge. I was also excited today to be mentioned on the Bella Couture blog. So enough of my rambling…. I had fun presenting my cupcakes to the public. 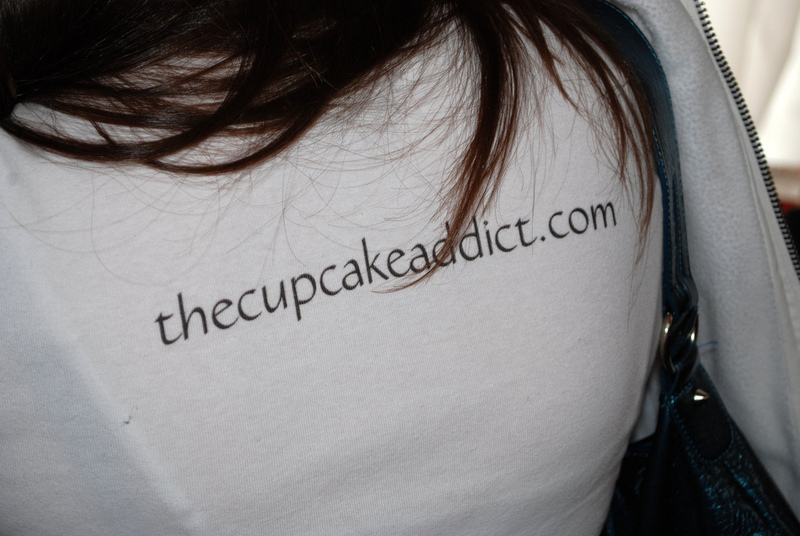 Thanks to Alla and Millie for wearing their TheCupcakeAddict.com T-shirts to the event. Thanks to the presenters and sponsors for all their efforts. There were a few kinks (like running out of cupcakes and some overcrowding), but it sounds like they are already thinking of ways to improve next year.